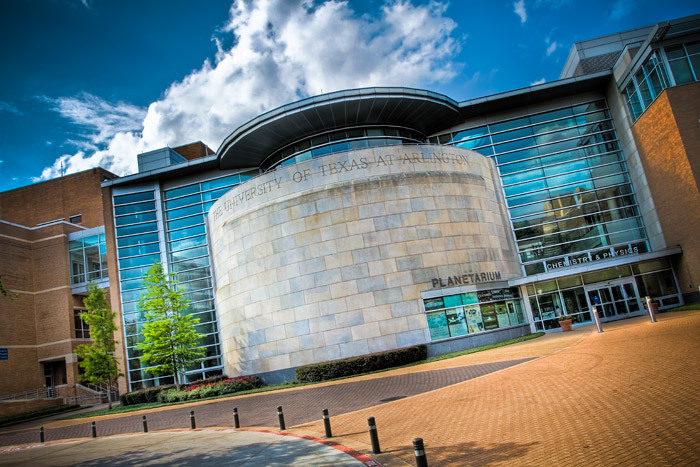 UTA Planetarium is located in the Chemistry & Physics building on the UTA campus. UTA Planetarium is one of the three largest planetariums in Texas located in Arlington on The University of Texas at Arlington campus. With its 60-foot dome projection surface, fully digital projection system, and advanced software, UTA Planetarium provides unparalleled views of the night sky, the solar system, stars, and distant galaxies — all complemented with Dolby® surround sound. The theater provides comfortable reclining seats for an audience of nearly 150, is wheelchair friendly, and can provide radio headsets for the hearing impaired. UTA Planetarium is the perfect tool to inspire students' interest in science and technology as well as to teach challenging concepts to students of any age. UTA Planetarium is available for field trips (K-12 public, charter, and private schools, summer camps, day cares, other groups) and offers a variety of shows for the public (see our public show schedule). What makes up a planetarium show? Our astronomers will provide a night sky tour, present the solar system and other point-of-interest objects, and cover trending astronomy topics. The session will be followed by Q&A and a pre-recorded program. Live presentations are customized for K-12 field trips to meet the current curriculum standards, TEKS, and teachers' specific goals. Our public show schedule lists only the title of the pre-recorded program. However, visitors should expect a live presentation (as explained above) and Q&A included with each show. The typical length of a planetarium show is one hour for K-12 field trips and 45 minutes for public shows.